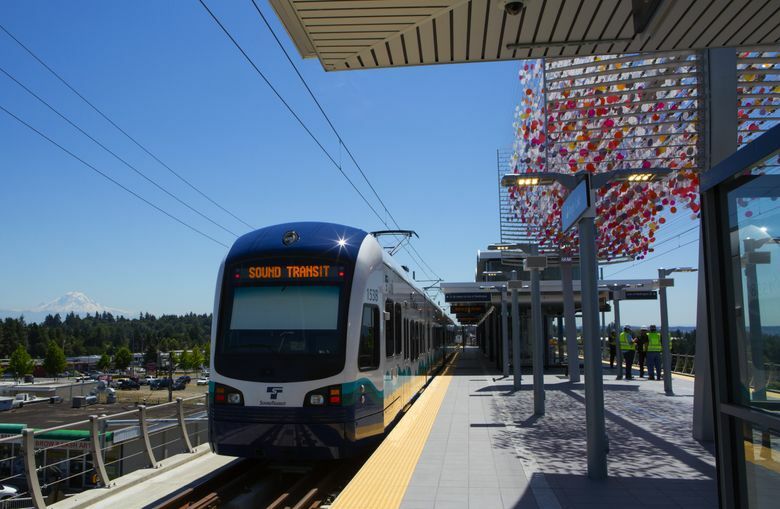 The opening day for Sound Transit’s Angle Lake light-rail station, south of Seattle-Tacoma International Airport, will be next month. The stop is expected to add 5,400 daily boardings to the system. Sound Transit’s new Angle Lake light-rail station will open Saturday, Sept. 24, the agency announced Wednesday. The stop south of Seattle-Tacoma International Airport in SeaTac is projected to add 5,400 daily boardings to the 21-mile train corridor, because of the many ways passengers can reach it coming and going. These include 1,120 park-and-ride spaces, a one-block walk to the RapidRide A Line bus corridor on International Boulevard South, sidewalks to motels and apartments, and a drop-off loop for taxis or friends with cars to meet riders. A trip from Angle Lake to Westlake Station in downtown Seattle will take 41 minutes. Besides airport commuters, the site is likely to attract sports fans as football season arrives. The Seahawks host the San Francisco 49ers on Sept. 25. Sound Transit bans parking for more than 24 hours at transit stations, so Angle Lake Station and the nearby Tukwila International Boulevard Station aren’t designed for people heading to the airport and wanting close-in, free parking while they are away. The agency expects to spend $40 million less than the $383 million project budget for the Angle Lake Station and 1.6 miles of elevated track from the airport, including $30,400 in construction cost per garage stall. This is the last light-rail station opening until 2021, when a mostly tunneled extension from Husky Stadium to the U District, Roosevelt and Northgate stations is to be completed. Angle Lake will be the southern terminus until 2023 or 2024, when the next station opens at Highline College in Des Moines.